He was born on April 27, 1950 in Yunki Postavy district of the Vitebsk region. He graduated from Vitebsk State Pedagogical Institute. SM Kirov (1972). Worked as a teacher. Since 1991 has been an employee of the newspaper “Vitbichi”. The author of the series “The first pancake with a lump” (1987), “Venus from the supermarket” (1994), “Striped life of the cat of Mitka and his friends” (1999), “Be healthy” (2004), “Well, there’s no laughing” (2004 ). 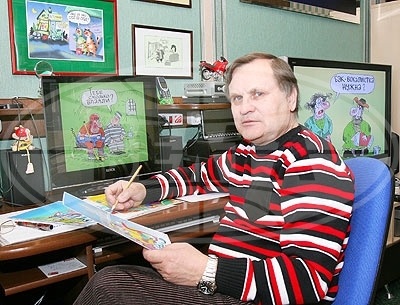 His works were included in the collections of caricatures of the magazine Vozhyk, the book “The Belarusians are Laughing” (2006). Prize of the newspaper Trud for the best cartoon of the year 1976, 1977. Member of the club of cartoonists “Zebra”.